Not to be confused with Europort. Eurosport owns a wide range of rights across many sports but generally does not bid for premium priced rights such as those to major football leagues. However, in 2015 it was awarded rights to broadcast the Olympic Games from 2018 for most of Europe and 2022 for the UK and France in a deal worth €1.3 billion (£922 million). It transmits much of the same footage across many markets, using unseen commentators rather than on-screen presenters so that the same visual feed may be broadcast in multiple languages while holding down production costs. Eurosport has also expanded its deal with The All England Club to show all the Wimbledon matches live in 16 additional countries. It is a 3-year deal that includes exclusive TV and digital rights. This expands their tennis portfolio to show all four Grand Slams. The network of channels is available in 54 countries, in 20 different languages, providing viewers with European and international sporting events. Eurosport first launched on European satellites on 5 February 1989. In the 1990s, Eurosport timeshared with The Quantum Channel. In February 2017, Discovery launched the channel in India, branded as DSport. The channel was made available on various platforms in both SD and HD feeds. Eurosport staff conducting an interview at the 2015 Winter Universiade's Alpine skiing event. Other sports events include the Paris Dakar Rally, Monte Carlo Rally, athletics events such as World Athletics Championships and the European Athletics Championships, cycling events such as the Tour de France, Giro d'Italia (except France) and the Vuelta a España, tennis events including the French Open, Australian Open, Wimbledon (31 European territories), the US Open, the World Championship Snooker, National Hockey League (only for Russia), World Boxing Super Series (only for Spain), and action sports like skating and surfing. In June 2015 it was announced that Eurosport had secured the pan-European rights (except Russia) to the winter and summer Olympic Games between 2018 and 2024. In July 2017 Eurosport had secured the domestic and international rights from 2017 to 2020 of the Italian Lega Basket Serie A (LBA). Eurosport is the new owner of the pay TV, international and internet rights. Eurosport has TV rights also for Italian Basketball Supercup and Italian Basketball Cup. In January 2019 it was announced that Eurosport will screen 39 ATP tennis tournaments including the tour finals in Russia for 3 years. Eurosport Events (formerly known as 'KSO Kigema Sports Organisation Ltd') is the Eurosport group's sporting events management/promotion/production division, which promotes the FIA World Touring Car Championship (WTCC), the FIA European Touring Car Cup and the FIA European Rally Championship. Eurosport Events was also the promoter of the Intercontinental Rally Challenge, a rival rallying series to the World Rally Championship. The IRC ceased at the end of the 2012 season, with Eurosport taking over series promotion of the ERC from 2013. Since 2008, the Eurosport Group has also been broadcasting the annual 24 Hours of Le Mans in full. On 29 September 2015, Eurosport acquired the Portuguese broadcasting rights for Formula One between 2016 and 2018. Region-specific events are noted in the table below with a flag indicating the country it is broadcast in. If no flag is present, the broadcast is multi territory. Prior to the creation of Eurosport, the European Broadcasting Union was acquiring substantial amounts of sports rights, yet its members were only able to broadcast a fraction of them. This provided the impetus for setting up the Eurosport Consortium, made up of several EBU members, to establish an outlet where these rights could be exploited. Sky Television plc was chosen as a commercial partner, and the channel launched on 5 February 1989. Eurosport was closed down in May 1991 after the competing Screensport channel had filed a complaint to the European Commission over the corporate structure. The channel was however saved when the TF1 Group (formed after the French government privatized TF1 5 years prior to the acquisition) stepped in to replace BSkyB as joint-owners. A new Eurosport channel was able to start its broadcasts the same month. On 1 March 1993, the cable and satellite channel Screensport merged with Eurosport. Eurosport eventually came under a French consortium comprising the TF1 Group, Canal+ Group and Havas Images. In January 2001, TF1 took full ownership of Eurosport. In May 2007, Yahoo! Europe and Eurosport formed a co-branded website which Eurosport used as its web portal, including an online TV guide, in the UK, Ireland, Spain, Italy and Germany. In 2008, Eurosport launched an online subscription service, Eurosport Player, that allows Internet users to watch both Eurosport and Eurosport 2 live, plus additional coverage not available via broadcast. During the 2009 Australian Open, the Internet player offered coverage from five courts. On 21 December 2012, Discovery Communications purchased a 20% stake in Eurosport from TF1 Group for €170m. Logo used from 2011 to 2015, part of a rebrand undertaken by Les Télécréateurs. On 5 April 2011 Eurosport rebranded its channel. The rebrand incorporated six new on-air idents along with a new logo and presentation style both on-air and off-air. The new on-air identity has been designed by Paris-based design company Les Télécréateurs. All localised Eurosport channels and the Eurosport website embraced the new identity. Eurosport, having been one of the first channels to broadcast on the Astra 1 group of satellites, was the last satellite channel in Europe to broadcast in an analogue format. On 30 April 2012, shortly after 03:00 CET, the rest of the remaining analogue channels at 19.2 East ceased transmission. Eurosport's analogue channel finally ceased transmission on 1 May 2012 at 01:30 CET, marking the end of an era in European satellite broadcasting. On 13 November 2015, Eurosport introduced its new brand identity and changed the name of its main channel to Eurosport 1. In Europe, Eurosport 1 is generally available in basic cable and satellite television packages. Since 1999, Eurosport 1 provides various opt-out services providing more relevant sporting content specific to language, advertising and commentary needs. Eurosport offers a stand-alone channel which provides a standardised version of the channel (Eurosport International in English). Alongside this there are also local Eurosport channels in France, United Kingdom, Italy, Germany, Poland, Nordic region, Benelux region and Asia Pacific. These channels offer greater sporting content with local sporting events, while also utilising the existing pan-European feed. The German version of Eurosport is the only one available free-to-air on European digital satellite television. Eurosport 1 is currently broadcast in twenty-one languages: English, French, German, Italian, Spanish, Portuguese, Dutch, Swedish, Norwegian, Danish, Finnish, Icelandic, Russian, Polish, Czech, Hungarian, Romanian, Bulgarian, Serbian, Greek, Turkish, Cantonese and Croatian. In Asia-Pacific territories, Eurosport offers a specific channel to this region. Eurosport (Asia-Pacific) launched on 15 November 2009. The service is available in Australia through Foxtel, Optus and TransACT. On 3 November 2014, a HD simulcast launched on Foxtel. This is the main channel of Eurosport. A high-definition simulcast version of Eurosport launched on 25 May 2008. The first event covered in HD was the 2008 French Open at Roland Garros. On 13 November 2015 it changed its name to Eurosport 1 HD. A supplementary channel featuring more live sports events, programming and news updates. Eurosport 2 launched on 10 January 2005 and is currently available in 35 countries, broadcasting in 17 different languages English, Swedish, French, Italian, German, Greek, Hungarian, Russian, Bulgarian, Polish, Portuguese, Romanian, Serbian, Turkish, Czech, Danish, Dutch, Spanish and Croatian. Eurosport 2 is self-describing as "the new generation sports channel" - dedicated to team sports, alternative sports, discovery and entertainment including basketball (like the Italian LBA), Twenty20 Cricket, Bundesliga, National Lacrosse League, Arena Football League, surfing, Volleyball Champions League, Australian Rules Football matches from the Australian Football League, Bandy World Championships and more. Eurosport 2 was branded as Eurosport DK in Denmark. On 15 February 2016, this channel was replaced by Eurosport 2. Eurosport 2 HD, a high-definition version of the channel, is also available. Eurosport 2 will also be launched in Asia Pacific in the foreseeable future. Eurosport 2 HD Xtra is a German pay-TV channel launched in 2017. Eurosport bought Germany-only rights for Bundesliga, Supermoto and other broadcasting rights. Eurosport 2 has no German-only signal and Eurosport 1 is free-to-air, so the new Channel was needed. Initial logo for DSport channel launched in February 2017. DSport is the Indian version of the channel launched in February 2017. It was made available on major DTH platforms and cable networks across India during the launch. The channel's primary focus would not be cricket, as per the press-meet at the launch. The current offering from the channel would include less-popular football leagues, cricket premier leagues, wrestling, fighting, golf, motor sports, horse racing, cycling and rugby. The channel is only available in high-definition format. However, few DTH operators downscale the feed to be presented with the standard-definition bouquet. As of 2018 DSport is available over 110 million households in India. Eurosport EPL Romania is a channel owned by Eurosport which broadcasts the English Premier League in Romania. It acquired the rights from the Premier League to broadcast the 2013–14 Premier League season. Eurosport Gold Russia is a channel owned by Eurosport which broadcasts the National Hockey League in Russia. It acquired the rights from the NHL to broadcast the 2017–18 NHL season. In the UK, British Eurosport launched in 1999, replacing Eurosport International on most platforms with some schedule variations and local commentary. The launch of British Eurosport and creation of programming specifically for the UK was initially funded by Premium TV, which did not have a stake in the sports channel, but received a share of the revenue. British Eurosport had live studio presentations of major sporting events and tournaments. On British Eurosport James Richardson previously hosted the coverage of Serie A football on the Channel from 2002 to 2005 and 2004 UEFA European Football Championship with regular guests including Alan Curbishley, DJ Spoony, former Chelsea FC players Paul Elliott, Ed de Goey, Ray Wilkins, Roberto Di Matteo & former Chelsea goalkeeper Carlo Cudicini now at LA Galaxy, former England International Luther Blissett and European football journalists Gabriele Marcotti and Xavier Rivoire. Will Vanders is known for his spirited coverage of K-1 events, and greets the viewer in Japanese, Korean, Chinese, and Thai to introduce the martial arts show, Fight Club, on Monday nights. For tennis, studio presentation for the Australian Open, French Open, U.S. Open and WTA Tour Championships on British Eurosport is hosted by Annabel Croft with the segment Hawk-Eye presented by former British number 2 Jason Goodall. (Goodall was briefly ranked ahead of Chris Bailey, Nick Brown, Andrew Castle, Nick Fulwood, Mark Petchey, and James Turner, in May 1989). British Eurosport covers the snooker season including ranking events not broadcast by BBC Television including the Shanghai Masters and China Open. Mike Hallett and former world champion Joe Johnson are among the commentators. British Eurosport has also three figure skating commentators: former Winter Olympic Games competitors Chris Howarth & Nicky Slater, and veteran commentator Simon Reed - brother of the late actor Oliver Reed. Tour de France coverage in 2014 was commentated on by Carlton Kirby (following the departure of David Harmon) with veteran cyclist Sean Kelly as the technical expert. The duo continued to commentate in 2015 and an additional pre and post programme was broadcast, "Lemond on Tour". This was presented by Ashley House with comment and analysis from Eurosport Cycling Ambassador Greg LeMond. Additional interviews were provided by Spanish cycling journalist Laura Meseguer and former pro racing cyclist Juan Antonio Flecha. David Goldstrom has commentated on ski jumping and ski flying events since the 1990s. On 10 February 2009, British Eurosport started to broadcast most of its programming in the 16:9 'widescreen' ratio. After the collapse of Setanta Sports, rights for the 2009 season in the USPGA Golf tour reverted to British Eurosport. On 25 July 2012, British Eurosport HD launched on the Sky, UPC Ireland and Virgin Media platforms, this replaced the pan-European Eurosport HD in the UK and Ireland. Despite Ireland not being in the UK, Irish viewers receive British Eurosport. British Eurosport 2 HD launched on 3 September 2012 on the Sky platform. Virgin Media has also carried Eurosport 3D to broadcast the 2011 and 2012 French Open and 2012 Summer Olympics. UPC Ireland also broadcast Eurosport 3D for the 2011 French Open. Throughout the duration of the 2012 Summer Olympics, Eurosport 3D also broadcast on the Sky 3D channel. On 13 November 2015 British Eurosport changed its names to Eurosport 1 & Eurosport 1 HD. In April 2010, Eurosport 3D launched but was only broadcast during a select number of events, such as the French Open and 2012 Summer Olympics. Eurosport DK was a Danish television channel owned by Discovery Networks Northern Europe. The channel replaced Canal 8 Sport and Eurosport 2 in Denmark on 1 July 2015. On 28 May 2015, Discovery Networks Northern Europe announced that they would merge Canal 8 Sport and Eurosport 2 into Eurosport DK in Denmark, broadcasting football from Danish Superliga, the Bundesliga, Major League Soccer, Capital One Cup, UEFA Euro 2016 qualifying, Tennis from ATP Tour, WTA Tour and 3 Grand Slams, Cycling from UCI World Tour, Winter sport, Motorsports. On 15 February 2016, the channel was replaced by Eurosport 2. Eurosport 3, Eurosport 4 and Eurosport 5 (and their HD equivalents) were additional channels created for the 2018 Winter Olympics broadcasting Olympic Broadcasting Services live and highlights streams for the duration of the Olympic Winter Games. A sports news channel launched on 1 September 2000, featuring live scores, highlights, breaking news and commentary. The service combines video, text and graphics with the screen being divided into 4 sections - a video section that displays highlights and news bulletins, a breaking news ticker at the bottom and a scoring section that gives in-depth analysis of results and game stats. Being an international channel, Eurosport's performance differs significantly between different countries. The figures below show Eurosport 1's share of overall viewing in some countries. ^ a b "TF1 & Discovery Communications finalise agreement and move forward to build three-tier strategic alliance across Eurosport, four payTV channels and production" (Press release). TF1 Group. 21 December 2012. Archived from the original on 22 October 2013. Retrieved 26 December 2012. ^ "Discovery Communications to acquire TF1 Group's Controlling interest in Top Sports platform Eurosport" (Press release). Discovery Communications. 21 January 2014. ^ "Discovery to take full control of Eurosport". 22 July 2015. ^ "Eurosport wins Olympic TV rights for Europe". BBC. 29 June 2015. Retrieved 9 July 2015. ^ "Eurosport serves Wimbledon further". C21media. Retrieved 5 August 2016. ^ "Discovery's D-Sport goes live today". Indian Television Dot Com. 6 February 2017. Retrieved 9 February 2017. ^ "IOC awards all TV and multiplatform broadcast rights in Europe to Discovery and Eurosport for 2018-2024 Olympic Games" (Press release). International Olympic Committee. 29 June 2015. Retrieved 30 June 2015. ^ "Return the World's best boxing to EUROSPORT with the exclusive broadcast of the ' World boxing SUPER SERIES ' - OcioNews". OcioNews. 4 October 2018. Retrieved 28 October 2018. ^ "Eurosport to be home of tennis in Russia following signing of multi-year deal with ATP and ATP Media". www.insidethegames.biz. ^ "Fórmula 1 vai correr no Eurosport". Diário Económico (in Portuguese). 29 September 2015. Retrieved 29 September 2015. ^ a b Laughlin, Andrew (31 March 2011). "Eurosport gets emotional with rebrand". Digital Spy. Retrieved 23 August 2013. ^ "Commission Decision of 19 February 1991 relating to a proceeding pursuant to Article 85 of the EEC Treaty (IV/32.524 - Screensport/EBU members)". Eur-lex.europa.eu. Retrieved 15 January 2010. ^ "Help for Yahoo Sports". ^ "Blood, sweat and tears". Marketing Week. 31 March 2011. ^ a b Les télécréateurs. Lestelecreateurs.com (12 December 2012). Retrieved on 23 August 2013. ^ "Discovery unveils new Eurosport brand identity". BroadbandTVNews.com. 12 November 2015. ^ Knox, David (29 September 2009). "Foxtel: "Watch what you want, when & where you want"". TV Tonight. Retrieved 9 November 2014. ^ a b "Eurosport 2 genopstår – Eurosport DK skifter navn igen". DIGITALT.TV. ^ "Discovery launches sports channel DSPORT". www.afaqs.com. Retrieved 9 February 2017. ^ "Discovery enters sports genre with the launch of DSPORT | TelevisionPost.com". www.televisionpost.com. Retrieved 9 February 2017. ^ GfK Romania S.R.L., "Eurosport acquires premier league rights in Romania". PremierLeague. ^ "More than a road digger?". Broadcastnow. 21 March 2001. ^ "British Eurosport launches HD channels". Yahoo! Eurosport UK. 3 July 2012. Archived from the original on 26 July 2012. ^ "Sky to broadcast Eurosport's 3D Olympics coverage". Digital Spy. 5 April 2012. ^ "Eurosport to serve 3D tennis across the continent". Broadband TV News. 15 April 2010. ^ "Eurosport goes 3D on Astra". Broadband TV News. 5 June 2012. ^ "Eurosport Danmark erstatter Eurosport 2 / Canal 8". DIGITALT.TV. ^ "Extra Eurosport channels for the 2018 Winter Olympics". BT.custhelp.com. ^ Ekip News. Ekip News. Retrieved on 23 August 2013. ^ "Eurosport Displaces Rtl9 As France Fave". Auditel. ^ a b "France: Eurosport tops cabsat ratings". rapidtvnews.com. ^ "TF1 Group". bouygues.com. Archived from the original on 8 July 2011. ^ "Rapporto ANNO 2008". Auditel. Archived from the original on 12 June 2009. ^ AGF - TV-Daten - TV-Markt - Marktanteile Archived 3 February 2009 at the Wayback Machine. Agf.de. Retrieved on 23 August 2013. ^ "AGF Videoforschung - MARKTANTEILE". www.agf.de. ^ "Jaarrapport 2003" (PDF). SKO Jaarrapporten (in Dutch). Stichting Kijkonderzoek. 2004. Retrieved 22 January 2014. ^ "Jaarrapport 2004" (PDF). SKO Jaarrapporten (in Dutch). Stichting Kijkonderzoek. 2005. Retrieved 22 January 2014. ^ "Jaarrapport 2005" (PDF). SKO Jaarrapporten (in Dutch). Stichting Kijkonderzoek. 2006. Retrieved 22 January 2014. ^ "Jaarrapport 2006" (PDF). SKO Jaarrapporten (in Dutch). Stichting Kijkonderzoek. 11 January 2007. Retrieved 22 January 2014. ^ "Jaarrapport 2007" (PDF). SKO Jaarrapporten (in Dutch). Stichting Kijkonderzoek. 11 January 2008. Retrieved 22 January 2014. ^ "Jaarrapport 2008" (PDF). SKO Jaarrapporten (in Dutch). Stichting Kijkonderzoek. 19 January 2009. Retrieved 22 January 2014. ^ "Jaarrapport 2009" (PDF). SKO Jaarrapporten (in Dutch). Stichting Kijkonderzoek. 19 January 2010. Retrieved 22 January 2014. ^ "Jaarrapport 2010" (PDF). SKO Jaarrapporten (in Dutch). Stichting Kijkonderzoek. 18 January 2011. Retrieved 22 January 2014. ^ "Jaarrapport 2011" (PDF). SKO Jaarrapporten (in Dutch). Stichting Kijkonderzoek. 18 January 2012. Retrieved 22 January 2014. ^ "Jaarrapport 2012" (PDF). SKO Jaarrapporten (in Dutch). Stichting Kijkonderzoek. 7 January 2013. Retrieved 22 January 2014. ^ "Jaarrapport 2013" (PDF). SKO Jaarrapporten (in Dutch). Stichting Kijkonderzoek. 20 January 2014. Retrieved 22 January 2014. ^ "Jaarrapport 2014" (PDF). SKO Jaarrapporten (in Dutch). Stichting Kijkonderzoek. 6 August 2016. Retrieved 6 August 2016. ^ "Jaarrapport 2015" (PDF). SKO Jaarrapporten (in Dutch). Stichting Kijkonderzoek. 6 August 2016. Retrieved 6 August 2014. ^ "Jaarrapport 2016" (PDF). SKO Jaarrapporten (in Dutch). Stichting Kijkonderzoek. 7 January 2017. Retrieved 26 January 2017. ^ Source: GfK Romania S.R.L., Copyright: ARMADATA S.R.L. "Audientele statiilor TV membre ARMA". ARMA. ^ "Årsrapport 2011" (PDF). Mediamätning i Skandinavien. Archived from the original (PDF) on 28 May 2013. 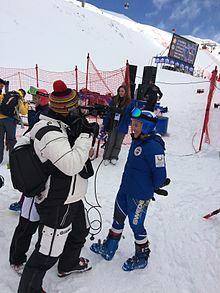 Wikimedia Commons has media related to Eurosport.